Who Wants To Be a Magpie? It was bound to happen sooner or later. A new site is offering to pay you to send sponsored tweets to your Twitter followers. Be a Magpie promises to convert your tweets into bling-bling if you allow them to spam your followers with commercial messages. According to Be a Magpie, you can make money with Twitter in three easy steps. You define a tweet frequency at which you will accept magpie-tweets for your Twitter account. Given your current tweet rate permits it, our service will try to find a matching magpie-tweet and twitter it. Magpie-tweets will contain the hashtag “#magpie” and thus be readily identifiable from your other tweets. For each successfully delivered magpie-tweet you will be rewarded in cash. Remuneration depends on the number of your followers and the popularity of the magpie-tweet’s topic. You select a the ratio between your normal tweets to paid tweet and Be a Magpie does the rest. The ratio can be as low as one paid tweet for every 20 normal tweets to as high as 1 to 1. The more paid tweets you run, the more you can make. I Am Going To Have Sooooo Much Bling! How much you make depends on how many Twitter followers you have, how often you hit them with paid tweets and the topic category. 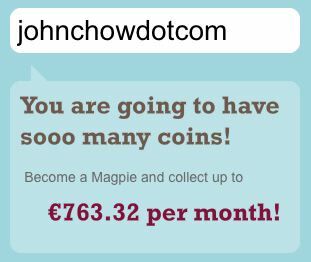 Be a Magpie has a little Bling-Bling calculator on their site to give you an idea on what you can make. Based on my 2,967 Twitter followers, Be a Magpie estimates that I would make 863.32 Pounds per month ($1,306.05 USD). That sounds pretty good but I highly doubt it can really make that much. I can’t imagine the service has signed up that many advertisers yet. There’s also the security issue. In order to send out the paid tweet, Be a Magpie needs your Twitter password. While Be a Magpie maybe a legit company, it might also be a huge phishing scam to take over people’s Twitter accounts. There’s also the questions of how many people will stop following you because you’re running paid tweets. Twitter doesn’t have anything in their TOS that specifically prevents you from being paid to make tweets. However, this doesn’t mean they won’t update their TOS and try to kill the commercialization of their service. I personally think they can’t stop it even if they try. Would You Be a Magpie? I’m interested to know how many readers would consider being a magpie. I’m also interested in knowing if you would stop following anyone who sends you a paid tweet. I’ve found the best way to make money from Twitter is indirectly. I use Twitter to help send traffic to my blog, which makes the money. This doesn’t mean I’m opposed to a service like Be a Magpie. However, I’m not for it either. I’m going to sit on the fence and watch for a bit. What do you think?